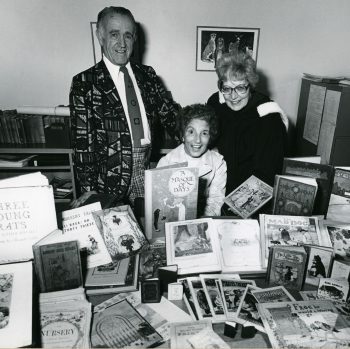 In 1976, Stan and Rose Arkley donated their extensive private collection of children’s literature to UBC Library’s Rare Books and Special Collections (RBSC). Stan was a member of the class of 1925, whose members had earlier donated the outstanding Alice One Hundred Collection to mark the 100th anniversary of the original publication of Alice’s Adventures in Wonderland and the 40th anniversary of their graduation. Stan and Rose Arkely pictured in 1979 with Sheila Egoff (R), who was a founding faculty member of UBC’s library school (now the School of Library, Archival and Information Studies) and an expert in children’s librarianship and children’s literature. Today, through purchase and donation, the Arkley Collection of Early and Historical Children’s Literature comprises more than 12,000 Canadian, British, and American children’s books, serials, and manuscripts. It has always prioritized popular works or “books that children actually read,” so it seems incredible that as late as spring 2015, it did not include a single Harry Potter book – the most popular children’s literature series in several generations. Yet it wasn’t until that summer that the RBSC began the process of acquiring complete sets of the US, UK, and Canadian first editions of the Harry Potter series. As books were added to the collection, RBSC learned more and more about the profound and surprising connections that Vancouver shares with the beloved series. As most fans know, the story of Harry Potter began in the summer of 1990 on a delayed train from Manchester to London, when the seven-year saga of a young, orphaned wizard “simply fell” into the mind of author J. K. Rowling. The story of Harry Potter in Vancouver began at Kidsbooks’ former flagship location on West Broadway in the fall of 1998. The store’s co‑owner, Kelly McKinnon, saw a reference in Publisher’s Weekly to the debut novel in the series and asked her partner, alumna Phyllis Simon, MLS’73, whether she had heard of this book that was making such a splash in the UK. 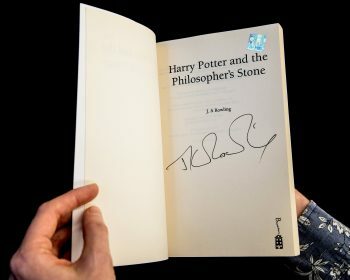 McKinnon and Simon asked Vancouver’s Raincoast Books, the Canadian distributor for Bloomsbury Publishing, to import 200 paperback copies of Harry Potter and the Philosopher’s Stone – a hefty order for a title with no track record. They sold the first 200 books within two or three weeks and ordered another 200, followed by another 400 – selling them all by word of mouth throughout that fall. Sometimes a book is special not because of the particular edition, but because of its provenance. This paperback copy of Philosopher’s Stone was previously owned by Felicity Walker, a young actress from Hertfordshire, England, who was the body double for Emma Watson’s Hermione Granger in the first three Harry Potter films, during which time she collected a wealth of often unique mementos from the productions. 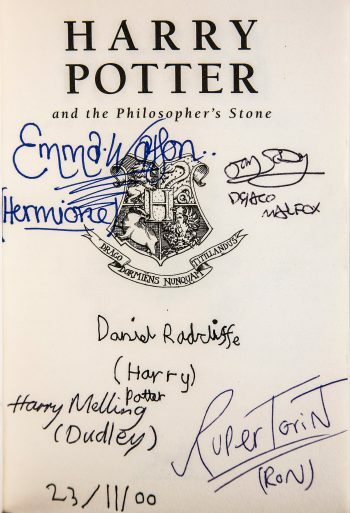 The title page of this particular book is signed by Daniel Radcliffe (who played Harry), Rupert Grint (Ron), Emma Watson (Hermione), Tom Felton (Draco Malfoy), and Harry Melling (Dudley Dursley). The book, which bears the date November 23, 2000, would have been signed during the filming of the first movie, when the young stars ranged in age from 10 and 13. Now all grown up, they have gone on to enjoy successful careers. But these childish signatures remind us that they were once just kids who had been given the opportunity of a lifetime to become part of a magical world. Despite the humble beginnings of the Harry Potter series, by the time the fourth book, Goblet of Fire, was published in 2000, the phenomenon and the fandom were in their full glory. The series was the topic of front page stories for major publications such as Maclean’s. With 1,900 pre‑orders for Goblet of Fire, Kidsbooks began preparations for a midnight book release party. Step one to hosting a fantastic Harry Potter party is creating a truly magical environment. Kidsbooks did this by hiring Vancouver interior designer Catherine Youngren to turn their 25-metre storefront into the Hogwarts School of Witchcraft and Wizardry. Youngren created the design for the enormous hand-painted wooden facade, and Ken Hollands, BFA’96, a UBC alumnus in technical theatre, built and installed it. The 500 free tickets to the first release party were distributed within six hours. Many fans arrived in costume and enjoyed a sorting ceremony (Hogwarts’ method for assigning students to different school houses), magic tricks, lightning-bolt tattoos, games, and, most importantly, the release of a new Harry Potter adventure. According to a National Post story published after the midnight party, Kidsbooks sold 500 copies of Goblet of Fire in just seven and a half minutes. They went on to host another three midnight release parties, the final one taking place on the great lawn at VanDusen Botanical Garden. Ticket sales for the party were capped at 3,500, and 5,000 books were ordered. In a 1999 interview in the Vancouver Sun, Kidsbooks founder Phyllis Simon said of the Harry Potter phenomenon: “I’ve never seen anything like this, neither in children’s nor adult publishing…. Not since Charlotte’s Web or The Lion, the Witch and the Wardrobe; but it’s so different, what’s happening with Harry.” Simon saw the phenomenon as reflective of the moment in which the series was born: a rare “magical reading experience” crossing both gender and age gaps, combined with the powerful promotional tool of global media. In terms of the lasting impacts of the series, Simon feels that the books legitimized children’s literature, bringing new respect to the entire genre. If the first UK edition of Philosopher’s Stone is scarce, the uncorrected proof of the book is even more so: only about 200 copies of this proof were produced. While the proof contains some of the text errors that are notable in the first edition of the book, it also includes a misprint of the author’s name, which appears as “J.A. Rowling” on the title page. This proof was signed by J. K. Rowling at a book tour stop at Carnegie Hall in New York on October 19, 2007. While Vancouver-based Kidsbooks was the first bookstore in Canada to carry Harry Potter and the Philosopher’s Stone, it was Raincoast Books that truly brought the series to Canada. In October 1998, Allan MacDougall, founder and then president of Raincoast Books, a local wholesale and distribution company, made his annual visit to the Frankfurt Book Fair. MacDougall knew that Kidsbooks was doing a brisk business with Philosopher’s Stone and happened to run into an old friend, Barry Cunningham, J. K. Rowling’s original editor at Bloomsbury Publishing. After making inquiries, MacDougall found that all Canadian rights for the first two books were still up for grabs. A quick phone call to London secured Raincoast’s distribution rights. A few weeks later, Bloomsbury offered Raincoast the opportunity to not only distribute UK editions of the existing Harry Potter books, but to publish Canadian editions. Between the rights acquisition in 1999 and publication of the final book in 2007, the company’s annual revenues at least tripled, with reported sales of 11 million Potter titles. The Barber Learning Centre is a large modern library facility built around the core of the original 1920s Main Library. 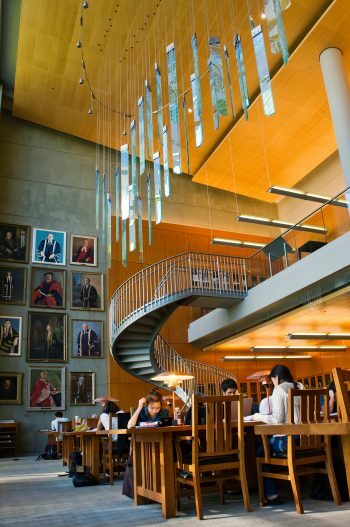 Like the original building, the centre includes a room named for UBC’s first librarian, John Ridington. However, it is probably better known by its unofficial name: The Harry Potter room – so called because of its winding staircase and walls covered in portraits (including Ridington’s). Ridington was a controversial character who would not have seemed out of place in a Harry Potter novel. He was known for his authoritarian approach to enforcing library etiquette, and the nickname King John soon stuck with irreverent students. “There are few of us who have not at some time seen his bearded countenance appear unexpectedly from behind a barricade of books, to gaze down reprovingly upon us, and, if need be, make a few remarks in pithy, and Johnsonese English,” reported the 1916 Annual. MacDougall was also responsible for bringing not only the Harry Potter series to Canada, but author J. K. Rowling herself. In March 2000, he attended a dinner at Goldsmiths’ Hall in London in honour of Harry Potter’s international publishers and found himself sitting beside the author. Over the course of the evening, MacDougall, with his characteristic charm, persuaded her to make her first trip to Canada in October 2000 for two historic appearances in Toronto and Vancouver. While in Vancouver, Rowling held a press conference with junior journalists, conducted interviews, and gave two readings for more than 10,000 fans at the Pacific Coliseum as part of the Vancouver International Writers Festival. Given the local impact of the series, the RSBC’s collection of Harry Potter books not only ensures that scarce first or special editions of these works can be properly cared for and made accessible to Canadians for generations to come, but allows UBC to tell the story of the effect this literary phenomenon had on the people, the business, and the cultural landscape of Vancouver. Rare Books and Special Collections conducts weekly tours on Wednesdays at 11 am. Visit rbsc.library.ubc.ca/visiting/tours for more information.